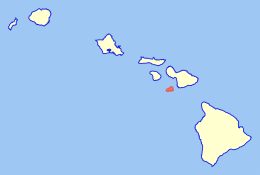 An ochtú hoileán is mó sna hOileáin Haváíocha is ea Kahoʻolawe. Is é Kahoolawe an t-oileán Haváíocha is mó gan daoine ina gcónaí ann. Ní raibh fásra méith ariamh ar Kahoolawe ó tháinig na chéad daoine ar an oileán. Mar gheall ar easpa uisce mhilis ar an oileán, ní raibh daonra mór ann, cé go bhfuil breis is 544 mír seandálaíochta inniu ann, an fáth a ndearna Ceantar Seandálaíochta Kahoolawe ar bun ar chuid mhaith den oileán sa bhliain 1981. Rinneadh buachailleacht ar an oileán sa 19ú haois. Ag tosnú sa Dara Cogadh Domhanda go 1990, bhain fórsaí armtha na Stáit Aontaithe úsáid as an oileán i gcomhair cleachtaidh agus traenála. Sa bhliain 1993 cuireadh Tearmann Oileán Kahoolawe ar bun ar an oileán ar fad. Tá cosc ar ghníomhaíocht ar bith ann seachas a bhaineann le cultúr traidisiúnta na Haváíoch nó leis na pleananna leathana atá ar siúl chun talamh agus dúlra an oileáin a athchóiriú. Táthar ag úsáid píobánra chun fíoruisce a chur ar ais sa talamh ar Kahoolawe. Tugadh an leathanach seo cothrom le dáta an 25 Meitheamh 2017 ag 16:21.